The German manufacturer of coated and bonded abrasives, Klingspor, is entering the diamond cutting blade market by investing in a new production facility at its factory at Velyki Mosty, Ukraine, about 50km north of Lviv, near the Polish border. Klingspor is committed to an industrial strategy with manufacturing at its heart and offers a product line consisting almost exclusively of items that it produces in-house. Having started manufacturing abrasives at the end of the 19th century, Klingspor is now a global manufacturer with 12 manufacturing locations with a turnover of more than €260M and 2,700 employees. Until recently Klingspor was virtually absent in the diamond sector, where it only offered a small product line sourced from partners. But since May 2015, the situation has changed considerably with the introduction of the company’s first diamond product line. Diamond cutting blades, a product line that accounts for only 3% of its turn-over, had a particular position and the question was finally raised of investing in the firm's own means of production. Three years ago the decision was made to expand in the diamond cutting blade market with the objective to become a major player in the global market. The first three steps have been taken to achieve this goal and subsequent steps are in the business plan to accompany the growth of the activity. The first phase of the Velyki Mosty plant was erected in 2010 to manufacture flap wheels, abrasives that require many manual operations and that have a definite economic justification in the Ukraine. As the facility had available capacity and the presence of qualified personnel in the Lviv region, the site was chosento accommodate the Group's diamonds, within a unit that would be dedicated exclusively to production. In 2012 Klingspor decided to expand its Velyki Mosty plant by erecting a second production facility dedicated to diamonds on a large building lot. The following year the first machines devoted to production of the first diamond cutting blades were received and others followed in 2014. Finally on May 2015, the new Klingspor line of segmented diamond cutting blades was launched with the series 300 Extra for the low end, 600 Supra for the price-performance ratio and 900 Special for the high end and the intensive applications. "This is a long-term approach that will ultimately make Klingspor one of the big names in diamond cutting blades on a global level," said Klingspor senior executive Wolf-Dietrich Pflaumbaum. The ramping up of the plant has been programmed with successive investment phases, in infra- structure, purchase of machines and training of personnel. The Klingspor research and development service, with its own production line for diamonds, is based in Germany at Haiger, with employees that include Ukrainians to facilitate exchanges with the Velyki Mosty plant. All of the studies are implemented in Germany and as soon as the products are certified, large-scale production will start in the Ukraine, where supplemental tests will be executed in the course of manufacturing and at the end of the manufacturing process. All the components are tested in Germany before use in manufacturing in the Ukraine. Klingspor has been setting global standards in abrasive technology for more than 100 years. The production facilities manufacture more than 50,000 items that fall, among others, into the product categories of coated abrasives, cutting-off wheels, grinding discs, abrasive mop discs and abrasive mop wheels and that are designed for a wide range of different applications. Spread across the globe, their 36 production and distribution locations employ a total staff of 2,700 and afford them the flexibility needed to satisfy the requirements of each regional market. The Klingspor global consulting team is composed of more than 300 field representatives, highly trained technicians and engineers. This is the first story in PDi Magazine about Klingspor Group. 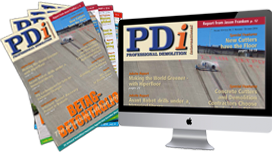 Another two stories about the products development, product lines, manufacturing and the European operations will be published in the following two issues of PDi.